WhatsApp has given in to user feedback, after facing backlash, a week after it replaced the text only status with its version of Snapchat Stories. 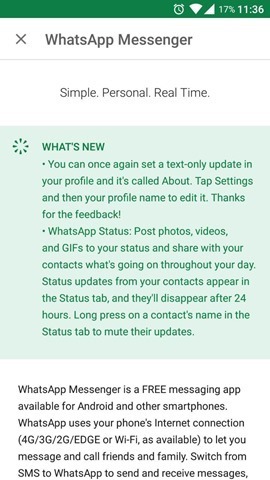 The new feature which allowed users to snap a picture and post it as a status, was not something that the average WhatsApp user (including myself) was used to. Hey, come on, this is not Facebook, right? Users began to complain about the persistent Status tab, which replaced the contacts tab too, something which has not been fixed yet. And just about a week ago, the beloved text statuses magically came back to the beta version of the Android app, and now we know why. The screenshot above is of the Play Store change-log for the WhatsApp beta version. You can set your text-only status from Settings > Profile. The return of text Status in WhatsApp is headed to the Android app next week and will follow on the iOS app soon.